As the light grew swiftly around them, and the shrunken sun lifted once more into the Jovian sky, Poole and Bowman reached out silently and shook each other’s hands. Though they could scarcely believe it, the first part of the mission was safely over. After an absence of 56 days the Vespa is home. Getting it back was an odyssey itself. We leave early Saturday on Terra Nova, my Yamaha Super Tenere. 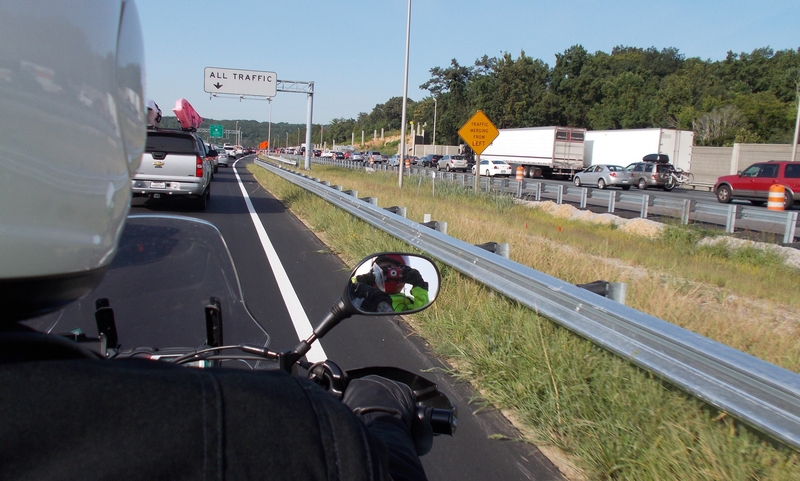 Naively, I thought we could scoot down I-95 and get into Richmond without hitting too much traffic. Well, that was pretty stupid. Southbound traffic quickly turns thick and 95 becomes a parking lot of grimly determined vacationers at the merger of the high occupancy vehicle lane. I can feel clutch plates burning as we negotiate the stop-and-go traffic. It would have been quicker to go to Jupiter. But we finally arrive, four hours later, and the Vespa looks perfect. “You’re good to go,” says Chelsea Lahmers, Scoot Richmond’s owner, and she explains how the old pump used plastic parts that expanded and seized when the pump got too hot. The new fuel pump, she says, has different material that’s unaffected by heat. The replacement was under warranty. 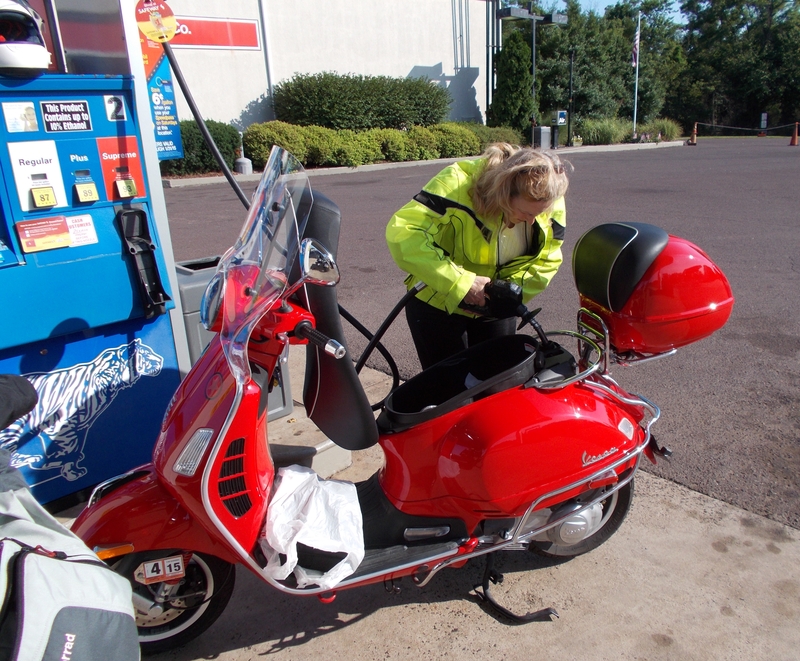 I ask about the notion that a Vespa gas tank should be kept a quarter-full for cooling purposes and she laughs and says no. “That’s just the Internet,” she says. We hang around Scoot Richmond to admire the Triumphs and Vespas, and talk to Chelsea about SR’s impressive expansion. After lunch at Camden’s Dogtown Market, we take our leave. We stay off 95 for the ride back, taking U.S. 60 west and turning north on U.S. 522 to State Route 28 and then home on I-66. We’re both tired but it’s a wonderful ride over quiet rolling hills past small towns and old buildings and I realize how much I’ve missed these pre-interstate highways that cross America. Route 66 gets all the glory, but some of those other roads are just as impressive. 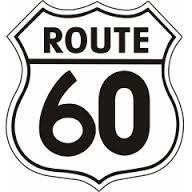 Route 60 is an old friend of ours. We rode it through Salt River Canyon in Arizona in 2007; that was an awesome ride. We were aboard Endurance, my BMW R1150GS, and waited out a hellacious rainstorm under a gas station canopy in Show Low with two guys on KTMs and a couple on a Harley. It was like riding through a car wash.
We left when the rain eased up a little, but the descent into the canyon turned London foggy and the rain started up again. We were riding through gray sheets of water with only a tiny guardrail between us and a thousand-foot drop to the canyon floor and I started laughing hysterically at the absurdity of it all; Linda thought I’d lost my mind. Someday, I’d like to retrace Route 60’s original path. It used to run from Virginia Beach to Los Angeles, though it now ends northeast of Yuma, Arizona, at the intersection of I-10 at Quartzsite. That’s a ride for another day. 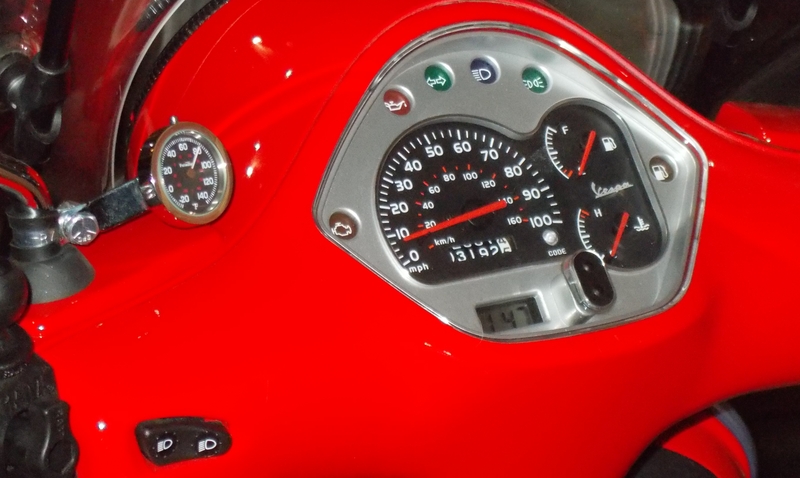 We’re too tired to do much once we get home but I fiddle with the Vespa the next day, installing the quarter-sized thermometer Linda liked and a new bracket for the rear Hyper-Lights. I have more work to do before this year’s ride, but it’s good to have the Vespa home. There are adventures even before the real adventures begin… if we slow down and look around. I met a friend in Cambridge City off of US 40 and was glad for the little jaunt on that freeway of times past!